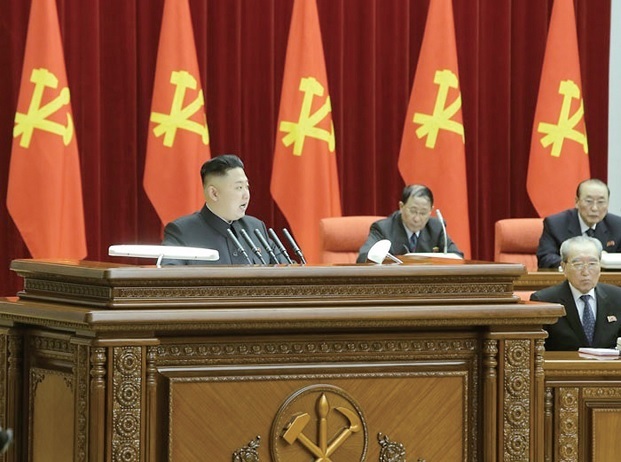 The March 2013 Plenary Meeting of the Central Committee of the Workers’ Party of Korea, the ruling party of the Democratic People’s Republic of Korea, put forth the new strategic line of simultaneously carrying on the construction of the economy and the upbuilding of the nuclear forces. This line laid down by the DPRK’s leadership aims at directing greater efforts to economic construction while consolidating the country’s defence capabilities by developing the nuclear forces, thus building a thriving socialist country. Proceeding from the requirements of the prevailing situation in Korea, the Party put forth the new strategic line. Now the situation on the Korean peninsula is extremely tense; there is no telling when a nuclear war might break out. The US and its vassal forces, picking a quarrel with the DPRK’s launch in last December of a peaceful man-made satellite, railroaded a brigandish “resolution on sanctions” at the UN Security Council. It was a hostile, outrageous act that illegalized the legitimate right of a sovereign state to launch a satellite, arousing the Korean people’s unquenchable wrath. As a link in the whole chain of substantial countermeasures to defend the country’s sovereignty and security, the DPRK was compelled to conduct the third underground nuclear test of a self-defensive nature. The US instigated the UN Security Council to adopt another “sanctions resolution”. In the meantime, it started the joint military exercises Key Resolve and Foal Eagle on a large scale on March 1. By enlisting the nuclear strategic striking means in the Korean peninsula from the US proper for the first time in history, it increased the intensity of nuclear threat to the DPRK and brought the situation to the brink of a nuclear war. 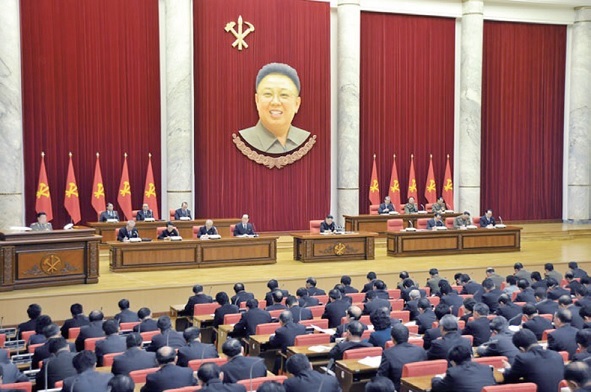 The historic March, 2013 plenary meeting of the Central Committee of the Workers' Party of Korea took place at the building of the WPK Central Committee on March 31. In the present acute situation, when the US, the biggest nuclear power in the world, threatens the DPRK with nuclear weapons, the DPRK’s determination to strengthen uninterruptedly its nuclear forces both in quality and in quantity is a quite justifiable and wise choice. The new strategic line is the most realistic line which conforms to the specific conditions of the DPRK which is striving to build a thriving socialist country. The Korean people have experienced innumerable bottlenecks and difficulties in economic construction for several decades, because huge manpower and material wealth which had to be directed to economic development and to improving the people’s standard of living were diverted to reinforcing the country’s military strength due to the continuous sanctions, pressure and threat of aggression by the US and other hostile forces. However, now that they have a powerful, self-defensive nuclear deterrent, the Korean people have become able to push ahead with the building of an economic power on their own terms under more stabilized circumstances. Time has gone for ever when the US threatened the DPRK with nuclear weapons and applied brake to its economic construction. The new strategic line will also enable the DPRK to further strengthen its defence capabilities at small expense without increasing military expenditure and make more investment in economic construction. The DPRK has a strong foundation of atomic energy industry which the world recognizes, and is abundant in uranium resources. Therefore, the Korean people are convinced that when they depend on the independent atomic energy industry they can build up the strong nuclear forces and ease the strain on electric power supply so as to accelerate the building of an economic giant and carry out satisfactorily all the tasks arising in improving the people’s standard of living. Attention should be paid to the fact that the new strategic line is based on the line of simultaneously carrying on economic construction and defence upbuilding, an important line of the DPRK in the past. 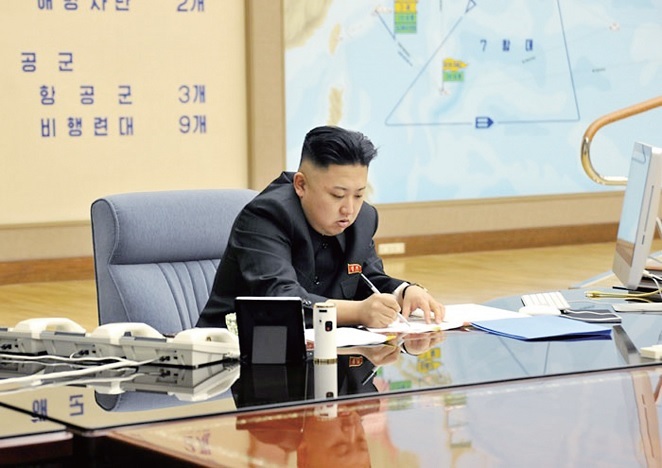 Marshal Kim Jong Un made a historic report at the March 2013 plenary meeting of the WPK. In early 1960s the United States created the Cuban missile crisis, and continued to commit military provocations to ignite another war on the Korean peninsula. Seeing through the gravity of the situation, President Kim Il Sung set forth the strategic line of simultaneously carrying on economic construction and defence upbuilding. In support of the slogan “Rifle in one hand and hammer or sickle in the other!” advanced by the President, the Korean people developed their independent national economy and at the same time consoldated the self-reliant defence capabilities. Taking advantage of the collapse of socialism in several countries towards the close of the last century, the imperialist allied forces concentrated their anti-socialist offensive upon the DPRK. In those days the Korean people waged a vigorous struggle to consolidate the powerful nuclear deterrent, following the line put forward by Chairman Kim Jong Il of giving priority to the development of national defence industry while simultaneously developing light industry and agriculture. As a result, they won victory after victory in the several rounds of nuclear confrontation with the United States, and firmly safeguarded socialism, thus achieving the great cause of becoming a nuclear power and bringing about a historic turn in the building of a thriving nation. Now the US and its followers threaten the DPRK that unless it gives up nuclear weapons, it cannot achieve economic development. On the other hand, they appease it, saying that they will help it to be well off if it chooses another way. However, the DPRK is different from Iraq or Libya that gave up the existing war deterrent, yielding to the imperialists’ pressure and appeasement, and, in the end, fell victim to them. The Korean people value the sovereignty and dignity of the country like life itself, and are ready to dedicate their lives to defend them. They will not be moved by any pressure and appeasement. 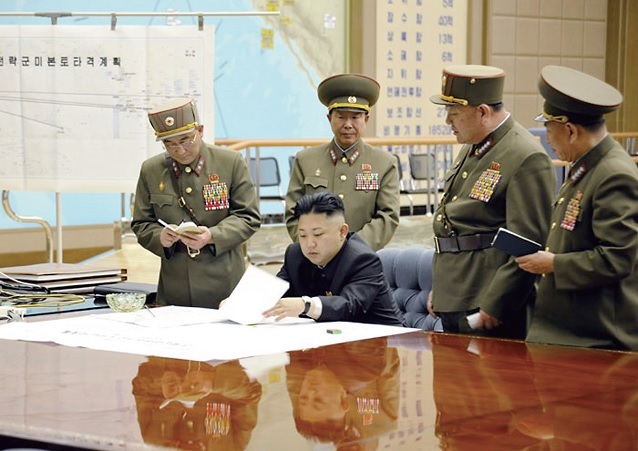 In other words, they will continue to bend their efforts to the upbuilding of the nuclear forces. The world will see clearly how the DPRK, depending on its mighty nuclear deterrent, builds a thriving socialist nation while frustrating mercilessly the threat of war by the imperialists and their followers.